English Regional Wine is made from grapes grown close to the limit for viticulture. All vineyards are positioned at above 49.9 degrees north leading to long daylight hours in the growing season. The climate is temperate with few summer days above 30°C. The diurnal temperature range is high. These wines are made from a wide range of grape varieties including hybrids and lesser known varieties, many of which are highly aromatic. These wines are typified by high acidity for the styles of wine produced. The northerly latitude of the vineyards in this PGI creates the long growing season and long daylight hours that are key to the development of strong aromatic flavours. It permits the use of a broad range of grape varieties whilst maintaining the fundamental characteristics that arise from England‟s extreme latitude. The moderate temperatures lead to crisp acidity. The minimum natural alcoholic strength, i.e. before enrichment, shall not be less than 6.00% volume. The process of enrichment (in accordance with the procedures laid down in Annex XVa, points A and B, Reg. 1234/2007) shall not increase total alcoholic strength by more than 3,00% volume. In exceptional years, and at the discretion of the Commission, enrichment up to 3.50% by volume may be authorised. 12,00% for red and rosé wines. De-acidification and acidification: The conditions and limits on acidification/de-acidification are those laid down for the production of Wine. De-acidification of fresh grapes, grape must, grape must in fermentation and new wine still in fermentation is permitted. De-acidification of wines is permitted only up to a limit of 1,00g/l expressed as tartaric acid. Acidification is not allowed, but in exceptional years and at the discretion of the Commission this may be authorised. Sweetening after fermentation is a separate process from enrichment. The total alcoholic strength of the wine can be raised by sweetening by up to 4,00% volume, subject to a limit of 15,00%. The sweet-reserve used shall be limited to grape must, concentrated grape must or rectified concentrated grape must. Albalonga; Albarino; Arbane; Auxerrois; Bacchus; Bolero; Cabernet Blanc; Chardonnay; Chasselas; Comtessa; Dalkauer; Ehrenfelser; Elbling White; Faber; Faberrebe; Felicia; Findling; Gewurztraminer; Gruner Veltliner; Gutenborner; Huxelrebe; Johanniter; Jubilaumsrebe; Kanzler; Kerner; Kernling; Madeleine Angevine; Madeleine Sylvaner; Merzling; Monarch; Muller Thurgau; Muscat; Nobling; Optima; Orion; Ortega; Perle; Petit Meslier; Phoenix; Pinot Blanc; Regner; Reichensteiner; Riesling; Roter Veltliner; Rulander (Synonyms: Pinot Gris, Pinot Grigio); Sauvignon Blanc; Sauvignon Gris; Scheurebe; Schonburger; Senator; Seyval Blanc; Siegerrebe ; Sirius; Solaris; Traminer; Villaris; Wurzer; Zala Gyongye. Acolon; Black Hamburg; Blau Portugueser; Blauburger; Blaufrankisch; Cabernet Franc; Cabernet Sauvignon; Cascade; Chambourcin; Dornfelder; Dunkelfelder; ; Enantio; Fruhburgunder (Pinot Noir Precoce); Gagarin Blue; Gamaret; Gamay; Garanoir; Heroldrebe; Kekfrankos; Leon Millot; Malbec; Marechal Foch; Merlot; Pinot Meunier; Pinot Noir; Refosco; Regent; Rondo; Triomphe; Wrotham Pinot; Zweigeltrebe. 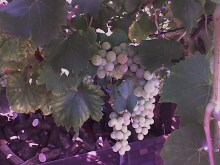 During the process of harvesting, wine-making and storage, wine-makers must ensure that potential individual English Regional Wines are distinguishable from other Wines and potential PDO Wines and that the control body (Wine Standards) can identify at any time whether a particular must or wine is destined for English Regional Wine. Particular attention must be paid to the compilation of accurate and up-to-date records on the production process and movement of must and wine in accordance with EC regulations. If on inspection by Wine Standards for annual certification the records fail to establish the criteria for the English Regional Wine Scheme, approval for the wine in question will be withdrawn and it must be marketed as a (non-PGI) Wine. Either the Wine Standards winery record sheet (form WSB 20) or an alternative record system approved by Wine Standards must be used. The detailed requirements are a matter for Wine Standards. Further advice can be sought from their Inspectors. (b) a no-fault tasting to test for presence of faults. In order to obtain English Regional Wine status, a wine must pass both tests. A minimum of 8.50% actual alcoholic strength. Total alcoholic strength must not exceed 15,00%. 2. Reducing Sugars: No parameters set: for information only. 3. pH: No parameters set: for information only. A minimum of 4,00 g/l expressed as tartaric acid. A maximum of 45 mg/l for dry wines as defined in Part B, Annex XIV, of Regulation 607/2009. A maximum of 60 mg/l for other wines. 10. Sterility: There must be no indication of yeast or bacteria liable to cause spoilage of the wine. 11. Protein stability: The wine must remain unchanged in appearance after being held at 70°C for 15 minutes and subsequently cooled to 20°C. The no-fault tasting (and appeals) can be carried out by the UKVA Wine Scheme Manager: he will ensure that the wine is deemed commercially acceptable. An independent appeal may be conducted in accordance with the provisions at Annex 1. English Regional Quality Sparkling Wines are made from grapes grown close to the limit for viticulture. These wines are made from a wide range of grape varieties including hybrids and lesser known varieties, as well as the more common sparkling wine varieties. Wines from this PGI are made entirely from must containing only natural acid. The moderate temperatures lead to the high acidity and low pH which is the backbone of fine sparkling wines. The minimum natural alcoholic strength of the cuvées, i.e. before enrichment, shall not be less than 6,00% volume. The total alcoholic strength of the cuvées intended for the preparation of English Regional Quality Sparkling Wines shall not be less than 9,00%. The actual alcoholic strength of English Regional Quality Sparkling Wines, including the alcohol contained in any expedition liqueur added, shall not be less than 10,00%. De-acidification of cuvées intended for the preparation of English Regional Quality Sparkling Wine is permitted without limit. Acidification of cuvées intended for the preparation of English Regional Quality Sparkling Wine is permitted up to a maximum of 1.50 g/l, expressed as tartaric acid. Acidification and de-acidification are mutually exclusive. Sweetening: Sweetening of the cuvées intended for the preparation of English Regional Quality Sparkling Wine is prohibited. Sparkling Wines, and that the control body (Wine Standards) can identify at any time the different cuvées or base wines. If on inspection by Wine Standards for annual certification the records fail to establish the criteria for the English Regional Quality Sparkling Wine Scheme, approval for the wine in question will be withdrawn and it must be marketed without a Protected Geographical Indication. Either the Wine Standards winery record sheet (form WSB 20) or an alternative record system approved by Wine Standards must be used. The detailed requirements are a matter for Wine Standards. Further advice can be sought from their Inspectors. for which the total alcoholic strength of the cuvées intended for their preparation shall not be less than 9,00% vol. Additionally, English Regional Quality Sparkling Wines must be made by the „traditional method‟. was separated from the lees by disgorgement. The addition of tirage liqueur may not cause an increase in the total alcoholic strength of the cuvée of more than 1.50% vol. This increase is measured by calculating the difference between the total alcoholic strength of the cuvée and the total alcoholic strength of the English Regional Quality Sparkling Wine before any expedition liqueur is added. The addition of expedition liqueur shall not increase the actual alcoholic strength of the English Regional Quality Sparkling Wine by more than 0.50% vol. Expedition liqueur is a separate process from Enrichment or Tirage. Each potential English Regional Quality Sparkling Wine for which a new tirage liqueur has been prepared and added, shall be subject to (a) an independent post-disgorgement analytical test and (b) a no-fault tasting to test for the presence of faults. In order to obtain English Regional Quality Sparkling Wine status, a wine must pass both tests. A minimum of 10,00% vol. A maximum of 18 milliequivalents per litre for white and rosé wines. The maximum is 185 mg per litre. A maximum of 0.50 mg/l. A maximum of 8,00 mg/l. No crystal deposits when held at 2ºC for 36 hours. • The no-fault tasting (and appeals) can be carried out by the UKVA Wine Scheme Manager: he will ensure that the wine is deemed commercially acceptable. • An independent appeal may be conducted in accordance with the provisions at Annex 1. Food Standards Agency (Wine Standards) is the competent body responsible for official controls as specified in Regulation 1234/2007. The organisation of annual verification will be undertaken by Wine Standards on a random, risk-based basis. The competent body will monitor and verify that the requirements of the Scheme including compliance with the characteristics and qualities for “English Regional” designation have been met. In particular it is concerned with labelling aspects and with the examination of vineyard and winery records. Wines which fail to comply, following checks by the competent body, may not be marketed with a Protected Geographical Indication. Laboratories used have to meet the minimum standards set out in the Regulations which is specified as ISO 17025 (or equivalent). If a laboratory other than Corkwise is used (in the UK or abroad) the applicant will be required to provide evidence that the chosen laboratory meets the appropriate or equivalent standards on the first occasion they are used. Should an applicant choose to submit a wine for appeal to a Tasting Panel, two sample bottles, labelled with the application number only, should be sent to the UKVA Wine Schemes Manager. A blind organoleptic test will be undertaken by a Tasting Panel consisting of not fewer than 5 and not more than 7 persons, drawn from four categories of tasters, with a minimum of 2 tasters from the categories (b), (c) or (d) below. A minimum of two thirds (66%) of the tasters will need to give a pass mark in each category in order for a wine to pass. For example, if there are 5 tasters a minimum of 4 will need to award a pass mark; if there are 6 tasters, a minimum of 4 will need to award a pass mark, and if there are 7 tasters, a minimum of 5 will need to award a pass mark. (d) Persons with oenology or wine-making specialism, Masters of Wine, or persons with a diploma in wine or wine making.